Stressed Out About Being Closed Out of Open Enrollment? The window of opportunity for taking advantage of the Affordable Care Act’s annual open enrollment period is about to close. In order to obtain health insurance coverage effective March 1, 2017, you must sign up starting January 16th and no later than the January 31st deadline. You may be thinking, “Eventually I’ll get around to it. No big deal if I miss the deadline, there’s always another one.” Yet the penalties for missing the January 31, 2017 deadline could affect your family’s health and finances. Not only will you be required to pay an income tax fine, 2.5 percent of your adjusted gross income, for not having proper insurance but delaying your decision will cost you more in the long run. Missing the January 31st deadline could mean your family would be without comprehensive, ACA compliant health insurance for one year. The only way you can enroll after the deadline is in the case of a marriage, divorce, birth, adoption or loss of coverage due to a change in employment. Think about it. What if you or a family member falls ill, requiring hospitalization or special care? Not to mention, without a plan in place, you’ll eventually pay higher healthcare costs the longer you wait. Although many physicians are frustrated by the limited choice of plans and higher costs this year, meeting the Affordable Care Act deadline for coverage is still the best option. While short-term plans may seem to offer lower monthly premiums, deductibles can be high and plans aren’t comprehensive. They don’t cover pre-existing conditions, routine office visits, maternity, mental health or preventive care like regular plans. The benefit of ACA-compliant plans is that providers offer discounts on services, which may add up to 50 percent off the prescribed usual-and- customary charges, 100 percent coverage for preventive care such as annual exams, screenings and vaccinations, and the option to have prescription drug coverage. An important point to consider about a short-term plan is that you could be turned down for coverage, leaving you without any health insurance for the year. Short-term plans also expose you and your family to lapses in coverage. For instance if you choose a six-month plan and do not renew, you will be without coverage for the remainder of the year. Also note that choosing short-term coverage doesn’t absolve you from paying the 2.5 percent tax penalty. It’s becoming more competitive for solo practitioners and those in private practice to attract experienced office staff and skilled medical technicians. Offering a solid benefits package that includes health coverage may provide you with an opportunity to obtain the healthcare coverage you prefer while making it easier to hire and retain the most qualified employees. Since they don’t work on commission, TMA Insurance Trust advisors are unbiased. They’ll do the research, suggesting the best options to fit your needs and budget, and taking care of the minutiae you don’t have time for. Why go it alone this year? 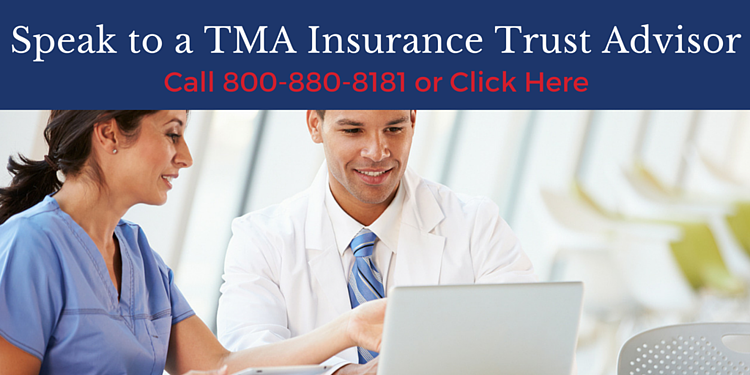 Let the health insurance specialists at TMA Insurance Trust get you to the finish line in time for the January 31, 2017 Health Insurance Open Enrollment deadline. And start the New Year off with less stress and healthy solutions for you, your family and your practice staff. Employee Health Plan Renewals: Will You Pay Too Much?